Iceland is one of the most perfect countries for road trips. The best and most convenient way to explore all the wonderful landscapes and fabulous waterfalls is by car. 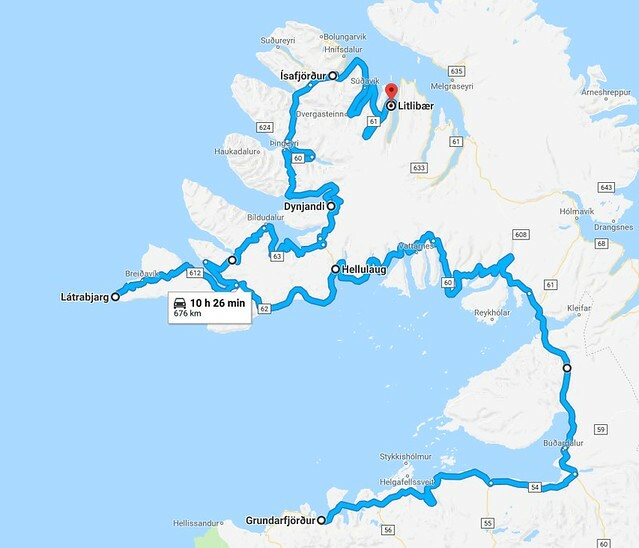 The Ring Road is the main road around the island and it’s the classic way to get around and visit those iconic sites like Goðafoss, Seljalandsfoss, Skógafoss or the Golden Circle. But it’s worth getting off the Ring Road from time to time and explore lesser known roads. Because wherever you drive in Iceland, you can be sure you’ve found just another amazing scenic drive. Like the drive around Snæfellsnes Peninsula. 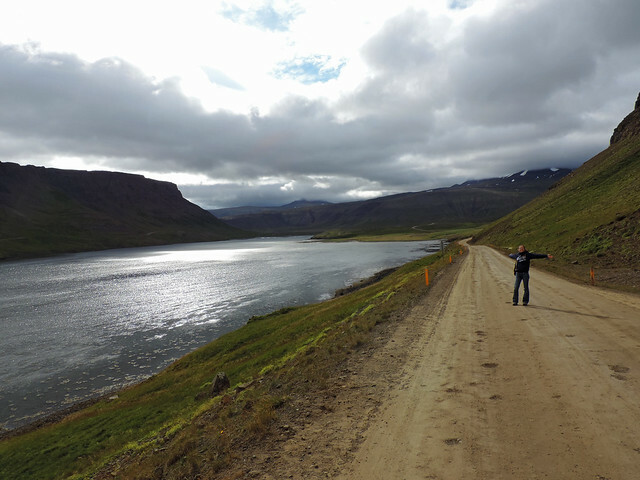 Or the drive along the Westfjords. Fjords in Iceland. The fact itself was a great surprise when we were planning our trip. We expected glaciers, wild beaches, countless waterfalls and volcanoes in Iceland, but we’ve never heard about its fjords before. 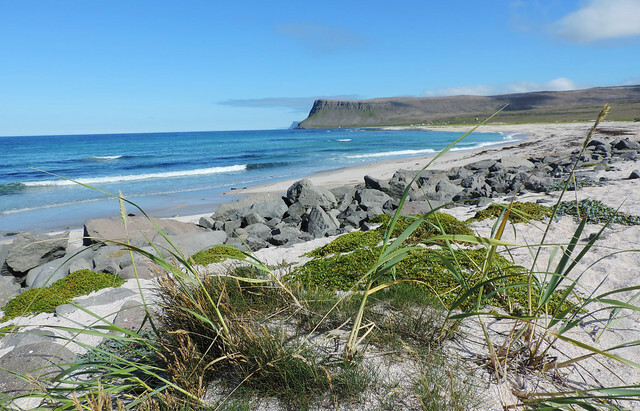 The reason is maybe that the whole peninsula of the Westfjords is off the beaten path – further from the Ring Road and further from the most popular Southern area. 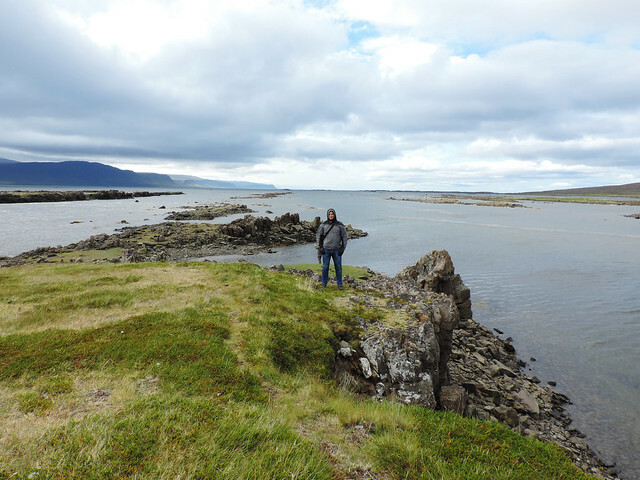 The Westfjords is not the typical place that most tourists include in their itinerary. 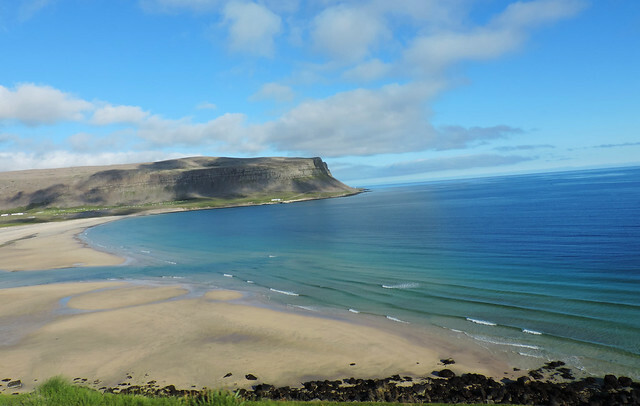 Though even attempting to name favorite areas to visit in Iceland seems ridiculous since we were so amazed by just everything we’ve seen there – still the Westfjords is somewhere at the top of the list. The landscape? 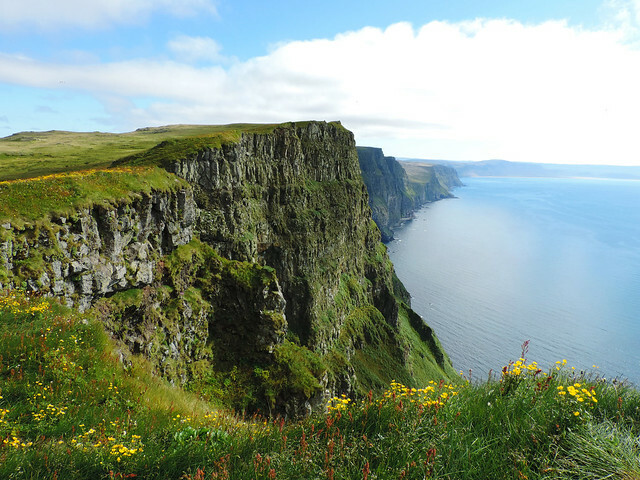 Mountains, fjords, stunning coastal views, large cliffs, countless waterfalls. Oh, mountains reflecting in the fjords on calm mornings. The roads? The kind of road where you meet only a couple of cars the whole day. Some paved roads, but mostly gravel. The population? Sparse. A bit more than 7000 people on the whole peninsula – about 4000 of them living in Ísafjörður, the largest settlement. We had no doubt that we want to visit this region and looking back the only thing we are sorry about is that we didn’t have a couple of more days to spend there. First of all, our route. After a bittersweet goodbye to Snæfellsnes Peninsula, we headed to the Westfjords from Grundarfjörður early in the morning. Soon we reached the beginning of the gravel road. We didn’t use the ferry between Stykkishólmur and Flókalundur because we wanted to drive along the Westfjords all the way. And that’s what we happily did in the following 3 (long-long summer) days. The main settlements on our way were Patreksfjörður, Ísafjörður and Hólmavík. Though their location is fabulous, we didn’t spend much time in them, because the best part of the Westfjords is the drive itself! We were a bit worried whether it will be too much driving and too little time spent out of our car during those 3 days… But we ended up stopping so many times and doing so many of the short and lovely hikes starting by the road that our scenic drive became much more than just a drive. 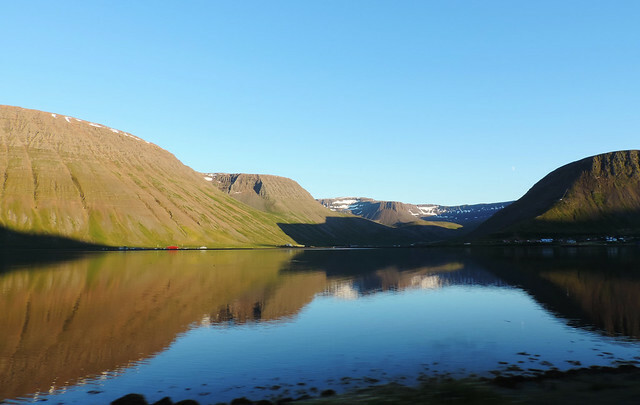 Since telling you that the Westfjords drive is stunning all the way doesn’t help your planning much (though it’s true), let’s see some of our favorite stops on the way. 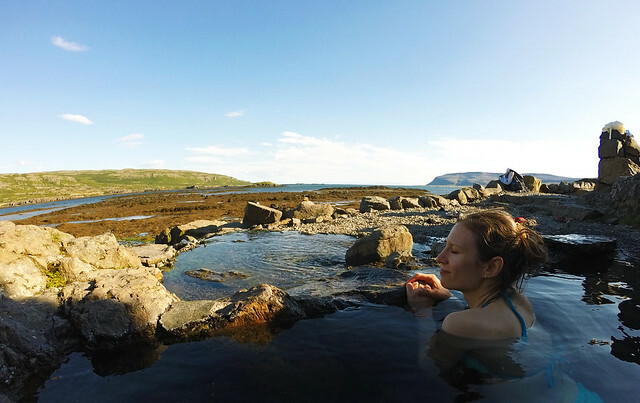 Hellulaug hot spring is the only natural hot pool we found in the Westfjords. It’s in Vatnsfjörður and signs clearly indicate its exact location from Hótel Flókalundur. It’s not very big – around 3-4 meters in diameter -, but 8-10 people can dip into it comfortably. 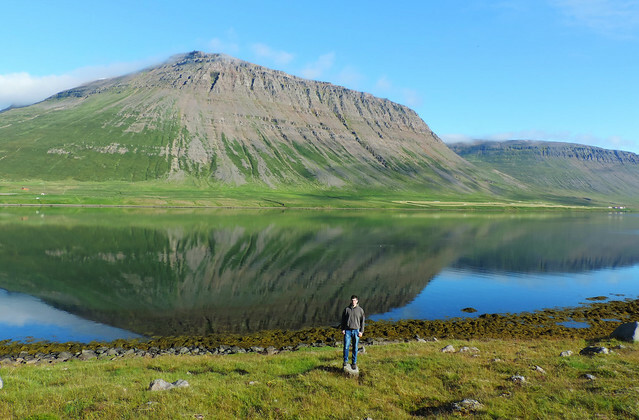 It has a pleasant temperature of 38°C and we enjoyed nice views of Vatnsfjörður fjord. It’s the place where hours just fly. It was a bit busy when we arrived but then a group of people left. Later we even had the whole pool to ourselves for about 20 minutes. Then some new people arrived. We can say it’s a busy place by Westfjords standards. But most people stay only for an hour or two to soak in the warm water and get some energy for the upcoming drive. There’s no admission and no services at the hot spring. Our only longer detour on the Westfjords drive was to drive to Látrabjarg on a beautiful dead-end road along Patreksfjörður. We drove all the way to Bjargtangar lighthouse where the road ends at a large parking lot. Even this drive itself would have been worth it – the secluded mountain landscape with lakes, pretty white sand beaches and ocean views. Then we had our first glimpse of Látrabjarg. The monstrous cliffs and the endless ocean made us feel like we are at the edge of the world. A noisy edge! The trail started from the lighthouse and led us to the edge of the scary cliffs where thousands of seabirds nest. Seagulls, northern gannets, guillemots, razorbills and yes, puffins, too! 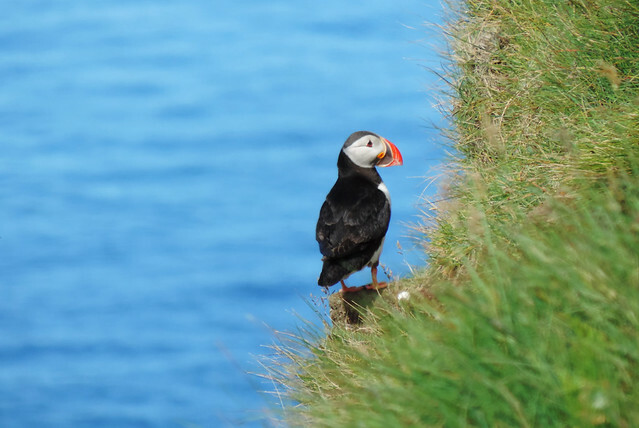 In fact, Látrabjarg was the only place where we’ve seen these cute birds on Iceland. The trail on the cliff edge is quite long, we’ve been hiking for 2-3 hours when we decided to return to our car and continue the drive. But the views are breathtaking all the way! 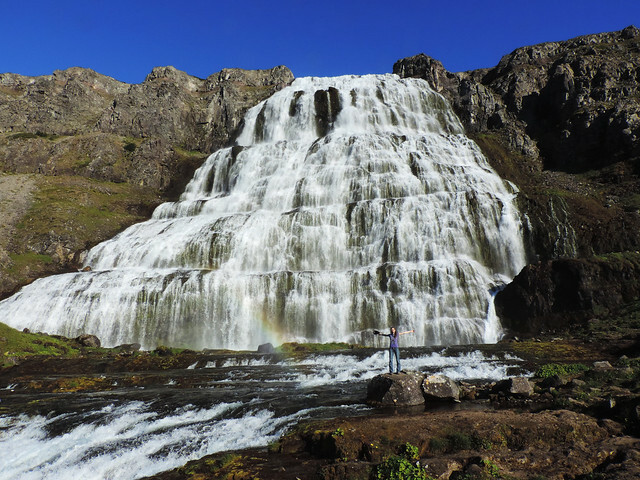 The largest waterfall in the Westfjords is Dynjandi with 100 meters. It’s a symmetric, impressive waterfall but what makes it even more spectacular is the other six waterfalls beneath the main waterfall. This short hike is a feast of waterfalls! Not to mention some great views of Arnarfjörður below. We could barely call it a hike it’s rather just a walk with some steeper sections and stairs. But every step is pure joy! 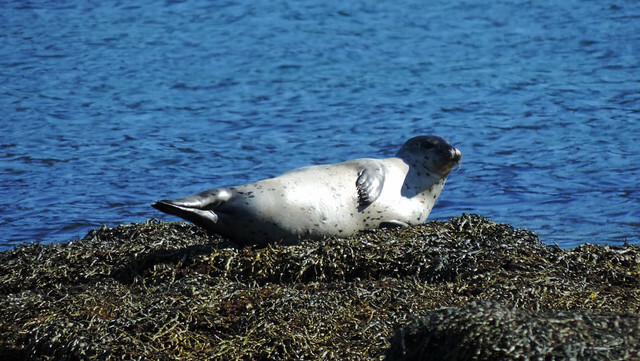 We are passionate about any wildlife watching opportunity so when we heard about the favorite rest area of the seals near Litlibær, we knew we have to stop there and give it a chance. We kept our eyes open but it was impossible to miss. First of all, road signs indicated the seals’ rest area and several cars parked by the road. Then we saw the seals, too. They were lying on the cliffs close to the shore. It was impossible to actually get to them because of the slippery cliffs and probably that’s what makes this place so great: the seals feel safe hanging around and all the curious people can watch them from appropriate distance. 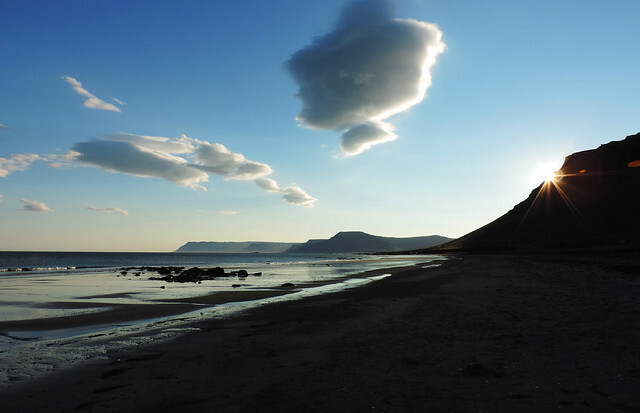 Anyway, the point we are trying to make is that driving along the Westfjords is definitely worth your time and effort! We can understand why it’s not on the “must-see” list of a lot of tourists visiting Iceland – it takes time to get there and also to get around on its narrow gravel roads. But if you can choose to include it in your Iceland itinerary, it will surely be an unforgettable experience and maybe even the highlight of your trip. We spent our first night in Grundarfjördur Hostel in Grundarfjördur. It has small but practical rooms, and pleasant, well-equipped common spaces. The building is very colorful inside and outside, and the location is quite scenic, too (the latter is not that unusual in Iceland, though). For the second night we stopped at a house called Rauðsdalur. It’s actually a guest house out there in nowhere, not far from Flókalundur. 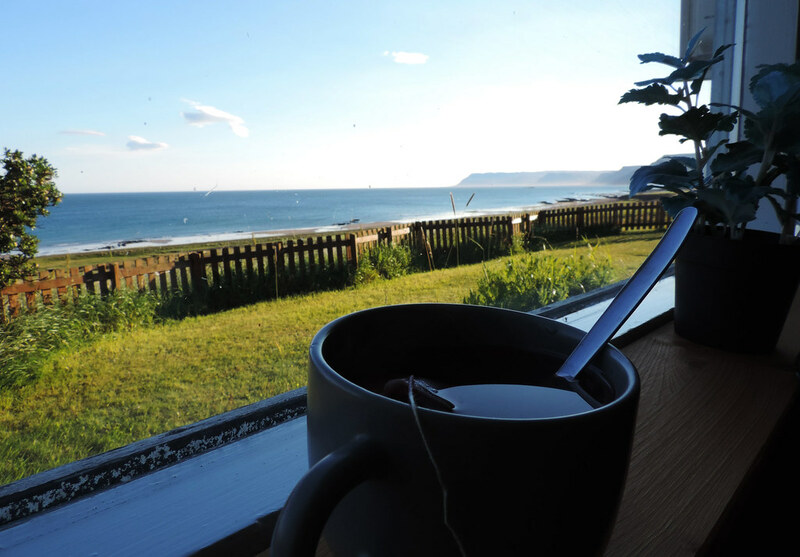 We had astonishing panorama of the fjord from the living room where we watched the sunset (kinda, it was August…) around 11:30 pm while sipping hot tea. Please note though that we don’t just randomly stopped at these guest houses, we booked them well in advance (like half a year in advance). That’s what we recommend you doing, too, especially if you visit in the busy summer season. The Westfjords are not busy, but there’s not too much guest houses either. Have you ever been to Iceland? Any favorite scenic drives? This post was updated in February 2019. What is the best place to stay there? The largest settlement is Ísafjörður. Grundarfjordur could also be a good option. But wherever you plan to stay, it’s worth booking it as early as you can. Where did you stay for the 2 nights (or 3?) there? 🙂 Thanks! We stayed at the Grundarfjördur Hostel first, then in GentleSpace Guesthouse in Ísafjörður. Both were nice, but we booked them way in advance. 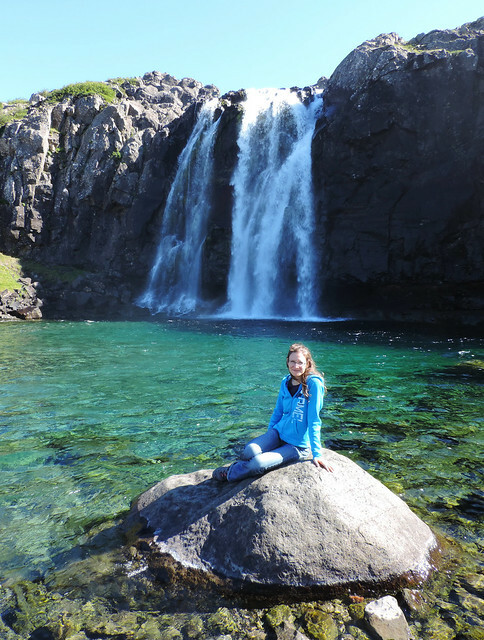 However, if you choose to do the drive through the Westfjords, you’ll see a lot of lovely waterfalls like this, that I can tell. Enjoy your trip!